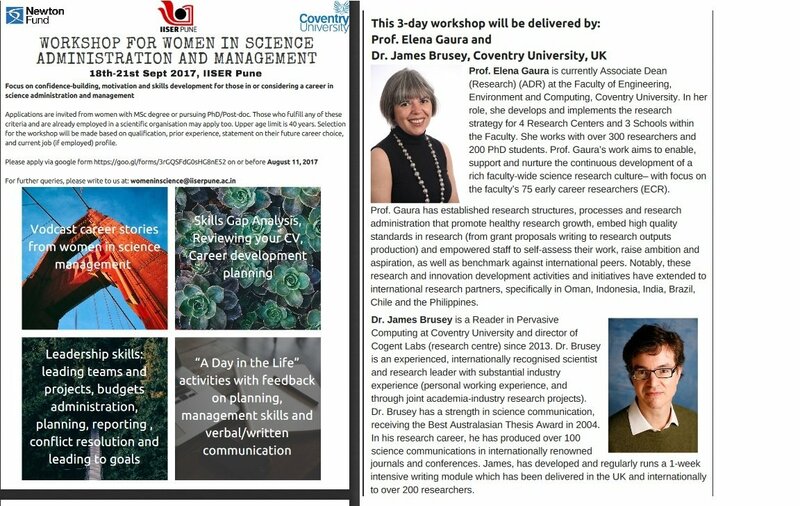 COESME at IISER Pune in association with the Newton Bhabha Fund (British Council) are organising: Workshop on Science Administration and Management for Women. The workshop aims to open up new avenues to retain trained women in science by targeting those who are making a transition from education to scientific careers. The programme is planned to generate a trained workforce to take on emerging roles in the growing scientific enterprise and to raise awareness about alternative career options in STEM. On September 18, 2017, one day prior to the workshop, there will be an Orientation Session on Careers in Science Administration and Management with speakers from India working in related areas. This session will be free and open to everyone. Details will be posted closer to the date. Trainersand Organisers: This workshop would be conducted by a team of experienced faculty from Coventry University, UK. The workshop is sponsored by the British Council, through the Newton Bhabha Fund and organized by MHRD’s Centre of Excellence in Science and Mathematics Education with support from the Science Management and Communications Team of IISER Pune. Listed on 24 Jul 2017.